The second day of the tournament started with our team in the middle of the pack, after having played 3 pretty difficult rounds. For the fourth round, we were paired against the home team, comprised of players who do rather well in the french inter-regional tournaments. For magic, the treeefather Ancient got Scrying, Fate’s Judment, Stars Align and Unerring Strike, while the Matriarch got Throne, Master of Stone and Entwining Roots. In deployment, we alternated with some fast drops (eagles, kestrels, wild huntsmen). Having already played against SE on the 2nd round, I knew it was imperative that I get the jump on the opponent’s firebase if I was to even the odds. So as soon as my opponent dropped his Sylvan Archers , I seized the initiative and deployed everything so as to get the first turn. The plan was simple: advance rapidly towards the enemy shooting, using the relatively hard to kill dryads and the treefathers as a battering ram while the dancers scored the objective. The Kestrels and Huntsmen to the right were there to keep the enemy fast units honest. On the left, the dancers and the Shapeshifter BSB performed a flanking maneuver, keeping their distance from the centrally-placed enemy pathfinder units. The middle advanced full steam ahead, with the entire bowline getting within range for an opening volley on the enemy Sylvan Archers. On the right hand, the Kestrels and Wild huntsmen maneuvered a bit; their role was to act as a deterrent for enemy scorers. 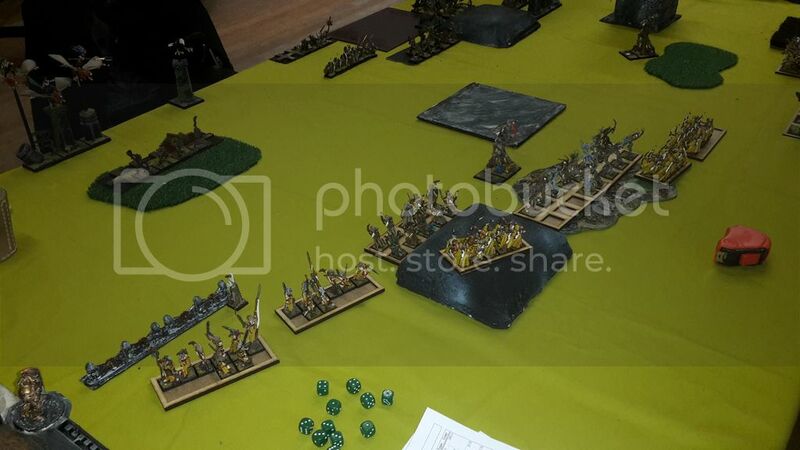 Magic was uneventful, but then the first shooting phase came: 30 Sylvan Archer shots amounted for 8 dead enemy Sylvan Archers, and the Pathfinders, using Truemark Arrows, dropped no less than 7 enemy Pathfinders from the BSB’s unit! Talk about counter-battery fire! 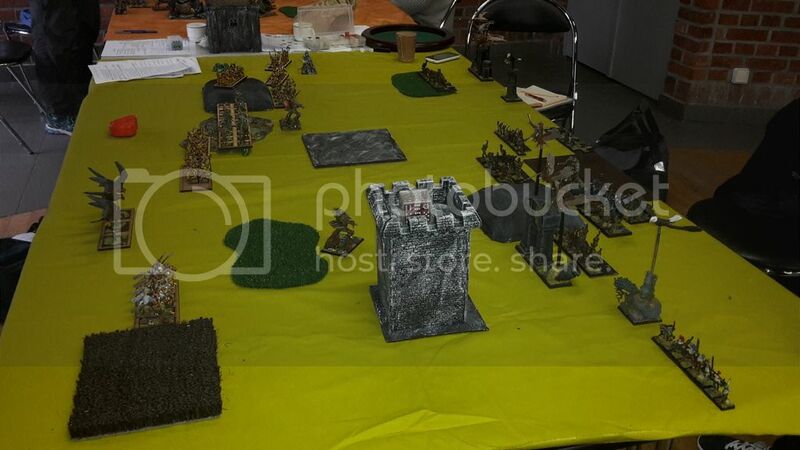 After the initial shock of losing half his shooting on the first turn, my opponent attempted to retaliate: on the right, Bladedancers , Kestrels and dryads advanced quite aggressively, followd by the Treefather Ancient and the skirmishing dryads. The BSB jumped ship into the second unit of Pathfinders and on the left the kestrels did the same thing my fast contingent was doing on the right: hug the edge of the board and scare things from coming inside the deployment zone. In the magic phase a failed to cast boosted Unerring Strike on my central Treefather meant that I could easily contain the first magic barrage. Shooting aimed at the righmost sylvan archers, killed 6 and panicked panicked the rest. They’d rally on the following turn. The depleted pathfinders aimed at my unit of master archers, but they failed to wound them. The Shapeshifter BSB spotted the dryads inside the forest and declared a charge against them. 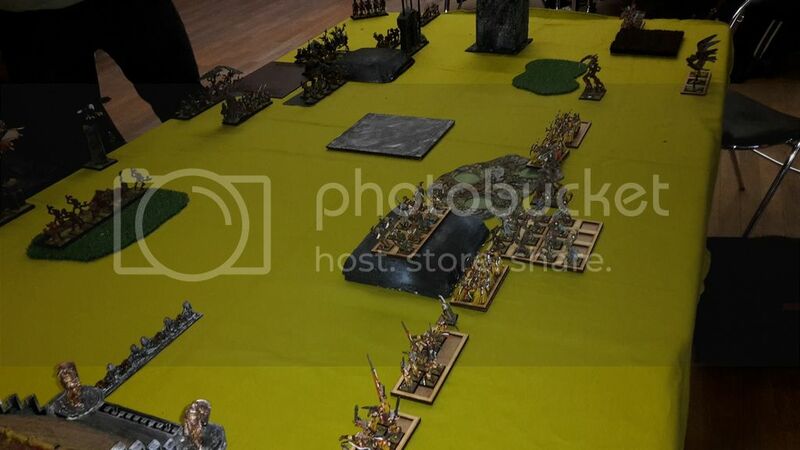 The rest of the army moved in an aggressive fashion: bladedancers towards the deployment zone, the two treefathers towards the enemy archers and dryads in the middle. The kestrels and wild huntsmen still held their ground. Magic started with a dispelled Master of Stone on the Kestrels near the building, and then Falanirm’s mistake from last turn became apparent: in the process of switching places of the BSB from one unit to the other, both Pathfinder units found themselves inside the forest. Two successful treesinging spells later, both units lay dead, and the Treefather Ancient had suffered a wound! The pathfinders focused their shooting on the now lone BSB, and they managed to kill him with a single volley (go Truemark Shots!). The Sylvan Archers and leftmost treefather killed four more Sylvan Archers, leaving just 5 alive. Finally, the dryads killed a single dryad with their Toxic Spores and the second Treefather felled a Briar Maiden with his roots. In combat, the Shapeshifter chopped 3 dryads down for no wounds back, but they held on their steadfast roll. With the shooting advantage gone, my opponent tried to press the advantage on the right flank, with Kestrels and Bladedancers performing a flanking maneuver. The Ancient approached my middle treefather, while the skirmishing dryads entered the ruin, exactly opposite mine. In the magic phase I let Fate’s Judgment go on the middle treefather, which cost him a single wound. I then stopped the Unerring Strike with my dice. Shooting did another wound on the treefather (Briar Maiden javelins). The shapeshifter/dryad fight continued, with the BSB now suffering a single wound for two dryads dead back. The steadfast forest spirits refused to budge, so the fight would go on. The bladedancers declared a charge on the afore mentioned dryads, the general’s dryads fell into the dryads in the ruin, the treefather on the left charged the now heavily depleted sylvan archers. The wounded treefather chose to bide his time, and maneuvered around the Ancient. Magic started with a successful casting of the throne, which allowed me to heal one of the treefather’s wounds. The rest was dispelled. Shooting went much better: between the Treefather’s roots, the Sylvan archer shots and the Pathfinders, the Briar Maidens all died and the Ancient suffered three wounds, leaving him on two. In the combat phase, the BSB and Dancers finally killed off the dryads, while the treefather ancient stomped all of the Sylvan Archers to the ground. Their death panicked the nearby kestrels off the board, to add to the insult! Finally, my general and retinue used their superior numbers to break and run down Falanirm’s Dryads. With all of the shooting gone, his general severely wounded and a good 2500 victory points down, my opponent chose to throw the towel. It was a 20-0 victory for the Smith Sylvan Elves, the first big win of the tourney! This is what happens when everything goes right. The crucial moment of the game was when I got the initiative and managed to get that first volley off. 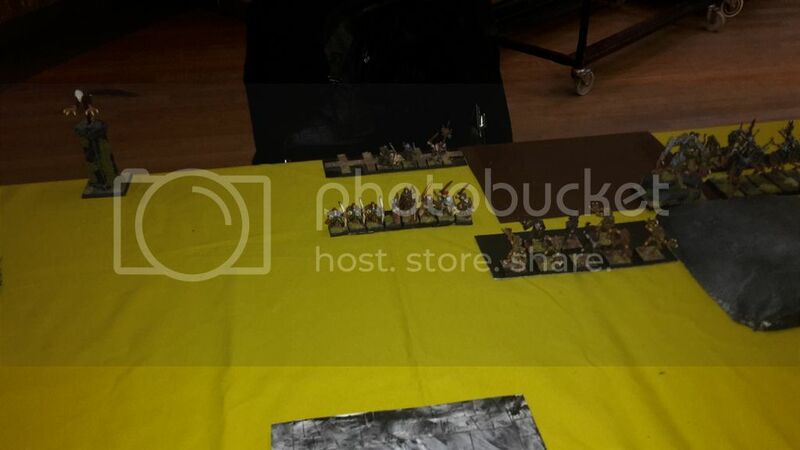 The pathfinders performed admirably, killing 7 of the enemy elites on turn 1, finishing off the BSB on turn 2, and killing the Briar Maidens on turn 3! This was without a doubt a frustrating game for Falanirm, since (as I learned on game no2) in mirror matches killing the enemy shooting battery gives you a very big advantage. In my case on game no2 I still had the two fighty trees to help pull me out of the hole, but in this match I had the superiority in terms of combat force. The only way to turn this around would have been magic, but the first two turns did not help at all. On a plus side, I can now say that this game was won by two things: Pathfinders and the Treesinging spell. Who would have thought that? The rest of the team didn’t do that well: our captain was plagued by very bad dice in a game against Beast Herds (in short, he didn’t manage to break the enemy Longhorns with 3 characters with his Furnace/monks, 2 units of flanking Thunder Hulks (that’s 4d6 s4 impacts + 14 s5 attacks), with the help of +1 to hit and reroll to wound on the monks and with -3 Ld on the Longhorns from the Witchcraft spell. The enemy held on a 3 after very bad dice, and then a gortach went to town on the monks until the furnace was left all alone. Sad times. 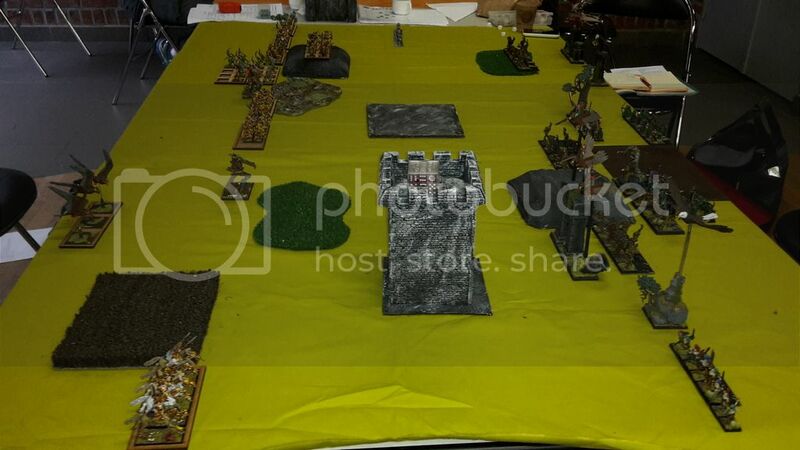 The round was decided on the game of our Vampires vs the Empire: in a brainfart moment, our VC player opted to charge his Vampire Count out of his unit to claim a scoring unit on the final turn. 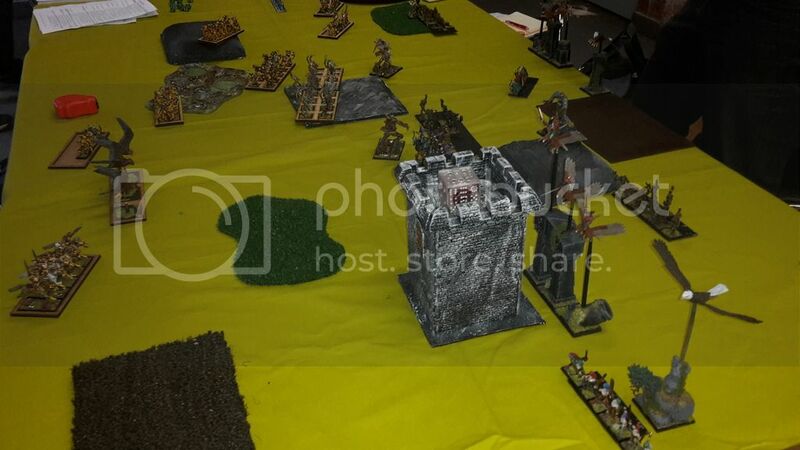 The charge failed, and the single empire cannon sniped the silly vamp. That will teach him! With a 1000+ points swing on the last minute, the game went from a medium win to a small loss. And we lost the round by 2 points! It happens to the best of us, but still a bit sad when it costs the victory!